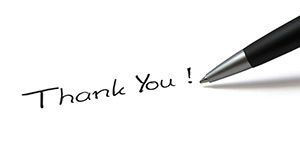 Immediately following any interview, you should begin composing a thank you letter. The integration of technology into our everyday lives has made electronic messages acceptable, and in many cases preferred. Plan to send the letter 1 or 2 days after the interview – depending on weekends or holidays. Keep the letter short and personalize each one – never use the same language in multiple letters. You should thank the person for their time and the opportunity to interview for the position. Mention something notable from the interview that you discussed. This point of reference will help distinguish your meeting from several others they may have had that day. It also shows that you were listening. Finish with a sentence or two about how you would provide value to their organization and express your interest in working there. It is critical to ensure you have the correct spelling of their names and email addresses. A discreet call to reception can confirm this information – or verify with your General Placement Service Consultant.